One of the enhancements made to Legend of the Seas during her 2013 revitalization was the addition of the Chef's Table. Although it is usually mentioned along with the ship's specialty restaurants, the Chef's Table is not a restaurant per se. Rather, it is a dining experience. In the last few years, several of the major cruise lines, including Royal Caribbean International, have added a chef's table experience to the menu of dining offerings provided on their ships. Each cruise line has developed its own variations on the chef's table experience. However, in general, an evening at the chef's table centers upon a multi-course gourmet meal prepared just for those guests participating in the experience. The various courses are paired with appropriate wines. It is also a learning experience in which you are guided through the courses and the wines by the chef and by a sommelier. On Legend of the Seas, the Chef's Table event is held each evening of the cruise. Participation in is limited to 12 guests. Guests wishing to participate must make reservations. The evening begins with the guests gathering together in the ship's Schooner Bar. The somielier, who also acts as the host for the evening, greets each guest as he or she enters the bar and seats them with the other guests who are participating in the event. Introductions are made and each guest is given a glass of the house sparkling wine. Most of the guests participating in the event were couples who had not met before. As a result, there was a slight awkwardness to this gathering at the beginning. However, one of cruising's great virtues is that people tend to be quite open to meeting and conversing with the new people they encounter and so the conversation picked up momentum as we sat in the bar and then throughout the evening. 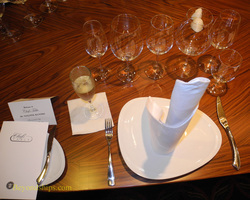 When all of the participants had arrived, the sommelier led us from the Schooner Bar to the Chef’s Table venue. Traditionally, chef's table events at sea have been - - and still are on most lines - - held in one of the ship's main dining rooms using one of the large tables. On the nights when there is no chef's table, that table just becomes one of the many large tables that populate the dining room. 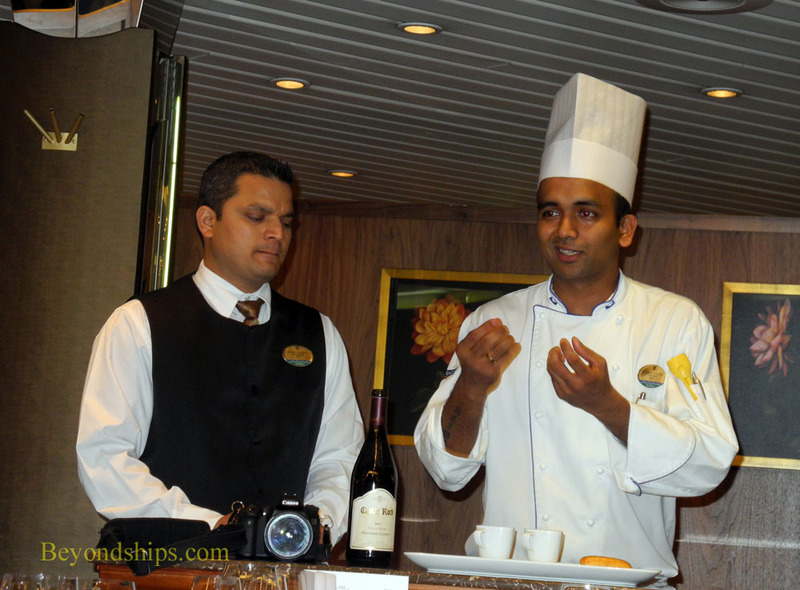 Royal Caribbean, however, has specific venues that are dedicated to the chef's table. These differ in location from ship to ship. On Legend of the Seas, a section of the balcony in the main dining room has been partitioned off from the rest of the room. Inside, this venue resembles a corporate board room with wood paneled walls and a large rectangular table dominating the center of the room. The guests are seated along three sides of the table. A podium occupies the remaining side. A place card marks the location where each guest is to sit. There is also a map included in the menu that tells you who is seated where, which is a great help if you did not quite catch the names of all of the people who you were introduced to in the Schooner Bar. Once the group was seated, we were introduced to the chef who had supervised the preparation of the meal. Standing at the podium at the end of the table, he described the first course that we were to have. This was more than a listing of ingredients and information about cooking times, rather he spoke with enthusiasm about how the various items came together to make up the dish in front of us. He was followed by the sommelier who was equally passionate about the qualities of the wine that was to be poured. It should be noted that this is a chef's choice menu. In other words, the guests are not given a series of options for each course and asked to make a choice. Rather, everyone has the same series of dishes. However, alternatives are provided to guests who are vegetarians and for those who have restricted diets. The Chef;s Table menu remains the same throughout the cruise. However, a different menu can be prepared for those guests who want to participate in the Chef's Table more than once during the cruise. Each of the courses was beautifully prepared reflecting the passion with which the chef introduced each course. Which course was the best depended upon each person's taste. However, there was wide-spread praise for the second course, which consisted of duck confit on a brioche and two soups - - one a celeriac cream and other a duck consomme. Paired with it was a very smooth Castle Rock pinot noir. At the end of the evening, each guest was presented with a copy of Royal Caribbean's cook book, Carte du Jour, which contains recpies from specialty restaurants found in the Royal Caribbean fleet. It is a cocktail table size book illustrated with photographs. The Chef's Table on Legend of the Seas was a fine meal served in a nice setting. However, it is more than that. We were impressed by the energy and passion that the chef and sommelier brought to their work. In addition, there was good conversation with people who had the imagination to try something different. There is a $95 cover charge for the Chef's Table, which includes the meal, the wine and the book.